Take your chicken breast meat and cut into small strips (Around 1×3″ is perfect for cooking), then place into a bowl of 2-3 beaten eggs, evenly coating. Typically 1 egg for 1 lb of chicken breast is sufficient. Using a large zip lock bag add your multigrain breadcrumbs with a dash of salt. 1/2c breadcrumbs usually is enough for 1lb of chicken, but you can always add more if the chicken is not fully coated. Once you’ve done this, individually add the chicken tenders allowing any excess egg to first drip off. (this is why you cannot just dump all the tenders in at once). Shake the bag or container with chicken inside for 1-2 minute’s until evenly coated with breadcrumbs. Using a frying pan, add olive oil to a shallow depth (I kept it around 1/5″ deep). Heat this over medium-high heat for 1 minute, then add your chicken tenders evenly placed within the pan. (You can test your oil to see if it’s ready by splashing a drop of water if it sizzle’s you’re good to go). Add your chicken tenders only a few at a time, and spread out flat and evenly with a bit of space between each. 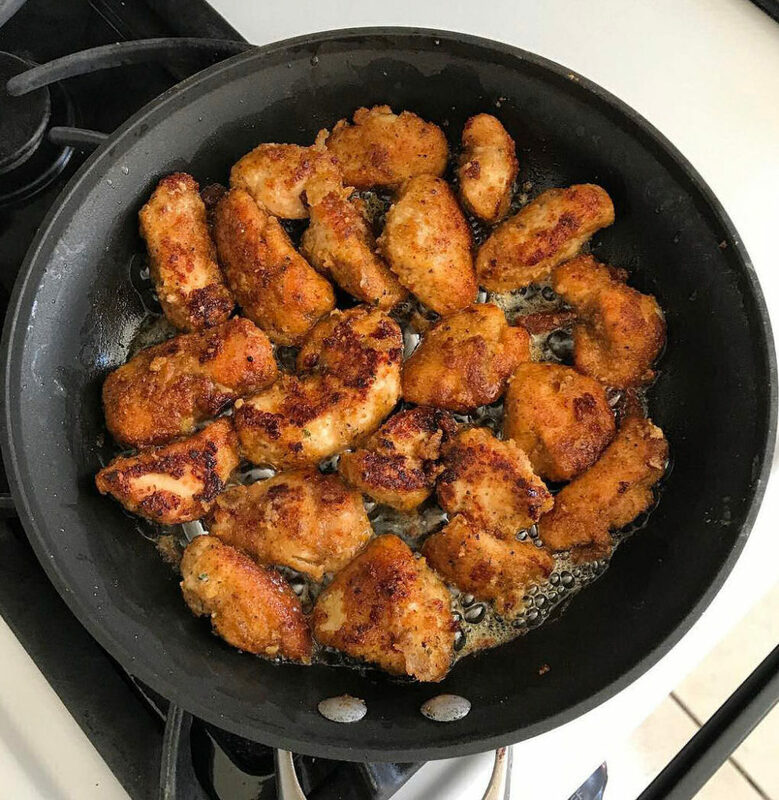 Allow chicken tenders to fry around 20 minutes flipping 1-2x until both sides have a golden brown coat. Once finished place the tenders on a paper towel to soak up any excess oil. Note: for a dipping sauce I recommend using A1 steak sauce (2g of sugar per Tbsp), reduced sugar ketchup (1g of sugar per Tbsp) or even a greek yogurt ranch / blue cheese dressing for the added probiotics. A traditional BBQ sauce will usually contain around 8-14g of sugar. All these tiny changes together really add up to reduce overall calories, esp. when it comes to fat & sugar.